The BrainSMART “clothes hanger” strategy helped me build better relationships with my students. I think that is because they saw a teacher who was ready to be with them, instead of an angry or frustrated teacher who they might not even want to talk to. Interestingly, this strategy reminded me of a Chinese movie about Chinese opera actresses. The title of this movie is: 虎度门 (pronounced “hu-du-men,” a Chinese phrase meaning “the stage door”). I am not saying that teachers are actors/actresses, but the idea is similar. One should leave any baggage at the door and enter prepared to immerse oneself in his or her role at that moment. Translating that into teaching, my role is being the teacher in this class, not the teacher in the previous period. I attended the BrainSMART workshop with CK, who serves with me on the Staff Well-being Committee. During the workshop, we identified some strategies which we felt could be beneficial to our colleagues. Together, we did two sharing sessions: one on sleep and the other on lifelong learning. A few non-teaching related workshops were organized for our staff on such subjects as yoga, batik painting, financial planning, and use of essential oils. It is very true that food can be therapeutic. 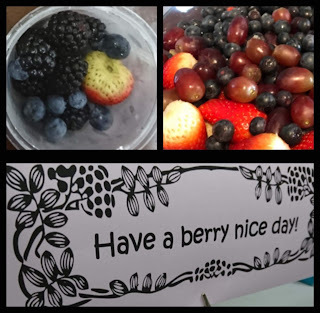 As part of the school’s initiative towards having a healthy lifestyle, we had a biweekly Fruity Week program in which different fruits were served to our colleagues every two weeks. What turned out to be the greatest hit among my colleagues were the berries! I first tried this out during a gathering with my friends. Blueberries were expensive. So, in order to make it more affordable, I added in some cheaper berries. The effect was nice, as the color combination was pleasing. With some modifications, CK and I rolled out the Berry Nice Day during our staff meeting. The berries were so popular that they were gone before some colleagues got a serving. The next day, we packed some for those who missed out completely. This idea was so well-received that during our year-end meeting, we had a Berry Funtastic Day, in which blueberries were still served as the base with other berries (e.g. cranberries, gooseberries) added in for color.